This activity would best be used in a Psychology or AP Psychology course as an example of classical conditioning. Students get with a partner and perform a classical conditioning experiment. They use a Neutral Stimulus (in this case, shouting JUMP AROUND!) in association with jumping rope to produce an increased heart rate to the shouting. 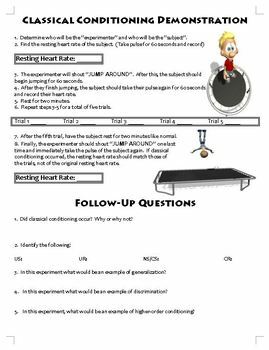 The worksheet has step-by-step directions for the kids, asks them to record their heart rate data, and asks follow-up questions which include having the students label the process (US, UR, NS, CS, CR) and create examples of what generalization/discrimination/higher-order conditioning would look like.